If there were an award for most popular ankle boot among top bloggers and stylish celebrities, it would have to go to Anine Bing for her Charlie boot. The Danish designer’s studded bootie has been seen on the likes of Jessica Alba, Chiara Ferragni, and Aimee Song—to name but a few—and is a favorite among fashion editors, too. As the first boots Bing ever debuted (three years ago now), they show no signs of losing steam. When asked why that might be, Bing explained, “They’re a statement piece that adds that little extra something [to an outfit], and all the girls I know who own them say they’re their most comfortable shoes. Handmade here in Los Angeles with the softest leather, you can just [sense] the time and love that has been put into them.” To get proof of that, we went behind the scenes to find out exactly how the beloved boots get made. Scroll down to learn about the production process. The process begins with Anine collecting inspiration and working with her design team to formulate a new style based on mood boards and sketches. For the Charlie boot, Bing tells us, “I wanted to create a statement boot! A pair that you could wear with anything: jeans, shorts and dresses. They give [any outfit] that extra edge.” As for the name? “I wanted to give them a strong name, and I also liked that this was unisex," Bing explains. 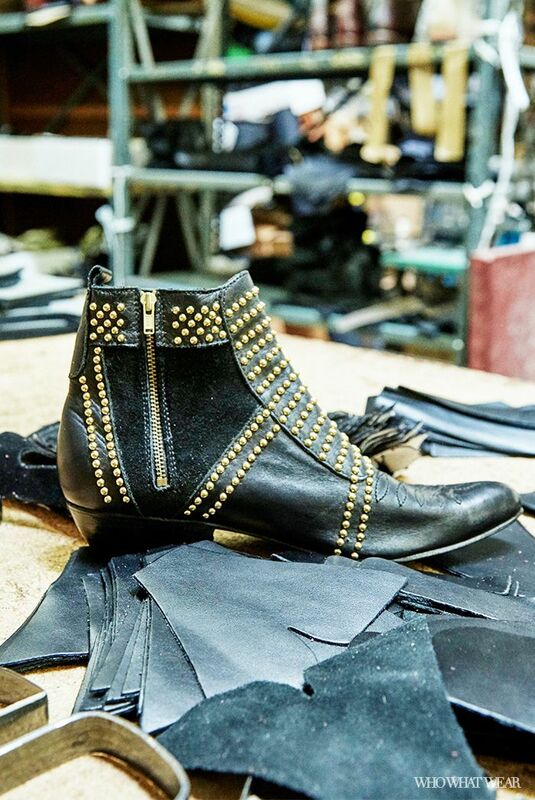 Once the body of the boot has been settled on, the design team specifies all details, such as the studs, buckles, and stitching, and what kind of leather will be used. A first sample is made and analyzed for any errors, and once it is perfected, the production begins. To begin, the manufacturers will cut the leather and suede pieces in line with their preset patterns. The pieces are then stitched together to form the upper portion of the boot, and the side zipper is attached. The studs are then machine-attached one by one, and once that’s finished, the upper body is sent to be embroidered. Meanwhile, the lining is being made. It is sewn using the exact technique as the upper body. Once the upper body is complete, the lining will be stitched inside of it. Next, the upper body is placed on a "last," which is the mold for the shoe. There is a separate last for each shoe size. They will then glue down the inside sole and insert nails around the leather body to hold it tightly in place. It will stay on the last for 48 hours. During this time, the outside sole, which is 100% leather, and the heel will be made. The heel is built on several leather layers that are glued and pressed together. When the sole is complete, it will be colored black, stamped with the Anine Bing logo, and attached to the heel. After 48 hours, the boot is removed from the last, and the sole (with heel) is glued on with assistance from heat activation and added pressure. The final step is to color the wood with black polish and shine the decorative studs. The boots are then inspected one by one to make sure they are 100% perfect. If so, they will be wrapped in tissue paper, placed in a dust bag, and put inside an Anine Bing shoebox to be sent to the store. Shop the Charlie boots, below! What brand should we go behind the scenes with next? Let us know in the comments!